Join us as we chat with fine and handmade jewelry designers, buyers and curators – drawing perspectives on how we define both handmade and fine jewelry, and where the two intersect. What values do we place on materials in comparison to aesthetic, technical skill and culture? We’ll hear from different perspectives within the jewelry world, as well as talk about each designer’s unique approach to their work! Rae Hugh is the one-half duo of JoRaeGO, a new jewelry line specializing in statement necklaces inspired by the founder’s roots in her Caribbean heritage. JoRaeGO started out as the brainchild of designers Rae Hugh and Jodi-Gaye Anderson who envisioned a collection of necklaces that compliment a woman’s every day. With pieces inspired by the tropics to be worn on the world stage, the designs are effortless and chic. With their debut collection in 2016, Salt + Fresh, they drew inspiration from the juxtaposing calm and chaos of the ocean and rivers from their childhood. This translated into one-of-a-kind pieces that were at opposite ends of the hue spectrum. With the launch of their second collection, Wood + Water, they went home to their roots to the sunny island of Jamaica (the land of wood and water) and produced a collection that is rich and elegant in its designs. Both girls aspire to inspire creatives. Their journey to partnership was fueled by the need to fulfill a creative destiny. Their tag line #GoAndBE is a note of encouragement to their customers to pursue with confidence, a mindset that showing up authentically is always enough. Each necklace is designed and carefully handcrafted in New York City. Passionate commitment to high quality work is the driving force behind Wendy’s art. She believes that quality craftsmanship speaks for itself, that an eye for quality is one of the most invaluable skills that can be taught and learned. Perhaps typically, because so often we don’t see the narrative of our own lives, Wendy doesn’t see her own life as a story of any significance, that it’s her jewelry that counts. But her journeys, choices and commitment, her dedication to and passion for beautiful, well-made things that have a meaningful origin, are inspirational and together craft a story that speaks clearly for itself and the character of its author. Stephanie PhaFa Roy was born in Brooklyn, New York in 1988. Her parents are Haitian immigrants that migrated to America in the 1960’s. PhaFa is the youngest of five children and she comes from a family of artists and educators. At the age of four she began to copy drawings by her brother Stevey Ray Roy who would adjust her sketches and teach her new artistic techniques. In order to escape her reality from the impoverished community that she was raised in PhaFa began to create fashion illustrations of clothing that she was not allowed to wear and could not afford. As her love for illustration grew so did her love for history and education. PhaFa attended the High School of Fashion Industrieswhere she was able to develop her sewing and illustration skills. She also had the opportunity participate in and win the Teens in Fashion competition and intern in the boys department at Rocawear before the age of seventeen. PhaFa then went on to graduate with honors from State University of New York Fashion Institute of Technology (F.I.T) with a Bachelor of Science degree in Art History & Museum Professions and a minor in Film & Media Studies. She also has an Associate degree in Fashion Design. PhaFa is an Artist and Creative Consultant. She uses her artistic talents to support social/civic issues and communities in need. Recently, she has collaborated on projects with the Queen Geniuses, The Office of Educational Opportunity at SUNY F.I.T, AFROPUNK, and the U.R.B.A.N Tattoo Convention, where she combined her creative instincts for product development and branding. Currently, PhaFa is the Visitor Services & Digital Content Manager at the Museum of Contemporary African Diasporan Arts (MoCADA), her primary focus is enhancing visitor engagement in the arts along with supporting brands in developing and selling their products in the MoCADA boutique. PhaFa is committed to using art as a tool for inspiration and innovation. Her debut exhibition on June 6, 2014 of fashion illustrations, Women of the Diaspora: We Be Rational, showcased 60 illustrations of alternative women of color whose personal style does not conform to the social norms. 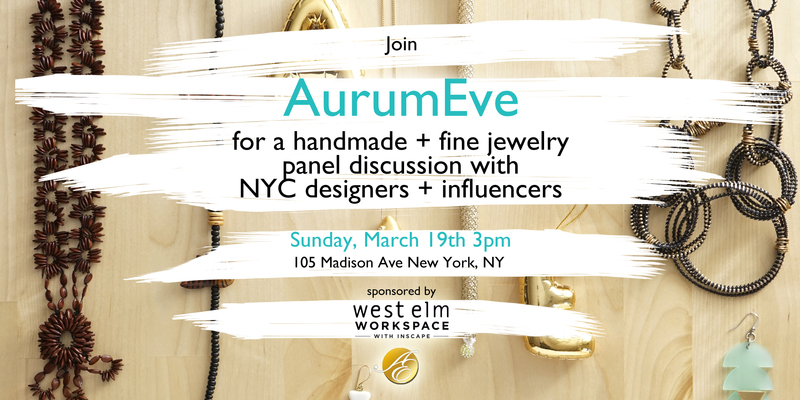 1 Comment on AE Jewelry Designer Panel @West Elm Workspace: Join us NYC ! Sounds like Aurumeve is still doing great things for the artist community! I’ll be there, can’t wait!